(L-R) Gigant3s stars Marco Antonio Solis, Marc Anthony and Chayanne® gather for their first full rehearsal today at the American Airlines Arena. “Today marks the beginning of an amazing musical journey for music fans across the nation,” said Henry Cardenas, Chief Executive Officer/President of CMN. “We are proud to present three of the most accomplished artists of our time in one major show." 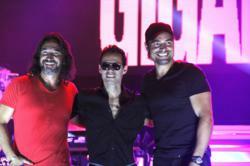 Three of Latin America’s biggest pop icons, Chayanne®, Marc Anthony and Marco Antonio Solis gathered for the first full rehearsal of this summer’s most anticipated Latin music tour, GIGANT3S. The first of 15 shows is set for Friday, Aug. 3 at the American Airlines Arena at 8:00 pm. Cardenas Marketing Network is producing the nationwide tour. GIGANT3S will continue to some of the nation’s major cities including Orlando, New York, Atlantic City, Chicago, Dallas, and Houston among others. Tickets are on sale and can be purchased via Ticketmaster.com or by calling 1-800-745-3000. For more information or to download photos and video of the artists, visit http://www.gigantestour.com.